STORY HOUR: Mondays or Thursdays from 10:30 to 11:15 a.m. Located in the Kids' Activity Room. No sign-up is required but space may be limited. There is no age requirement, but it is recommended that children should be able to sit and listen to 2 or 3 stories. A craft is provided. DROP-IN PLAY TIME: Wednesdays and Fridays from 10:30 to 11:15 a.m. Located in the Kids' Activity Room. No sign-up is required. Recommended for ages 4 and under. Toys and books are provided for playing and socializing. A simple craft or sensory activity will sometimes be offered. SIT, STAY AND READ WITH THOR THE DOG: Thor, a handsome golden retriever, visits our library most Thursday afternoons. Sign up IS required for this activity. 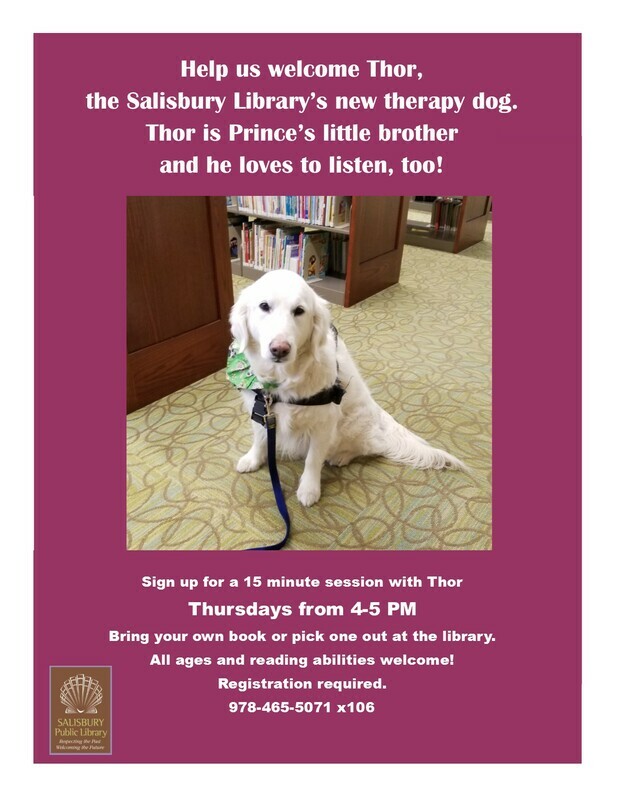 If you would like to read with Thor, contact the Children’s Room at (978) 465-5071 ext. 106. 15 minute time slots are available from 4-5 pm. Open to all ages, you can bring a book with you or choose one here at the library. “LIKE” our Salisbury Library Children’s Room Facebook Page (a great place to check for updates on activities). ​Salisbury Library asks that a responsible adult accompany children to all activities and please no food or drinks. If there is no school for the Triton Regional School District due to inclement weather, there will be no activities held that day. TumbleBooks are animated, talking picture books that teach kids the joy of reading in a format they'll love. Download the Tumblebooks App, visit www.tumblebooklibrary.com, or access TumbleBooks on our patron computers in the Children's Room. Remember to bring your own headphones when using the computers in the Children's Room.